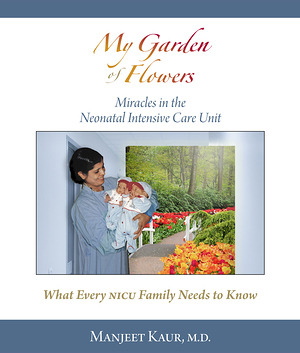 Truly a celebration of life, My Garden of Flowers takes the daunting mystery out of the NICU experience, and gives worried parents knowledge and reassurance that their critically ill infants will typically grow to adulthood and lead normal, healthy lives. It’s an invaluable resource for families who suddenly face the crisis of seeing their little cherubs amidst alien tubes and wires and the incessant beep of monitor alarms. These families are totally unprepared, anxious—no, petrified—and uncertain of what to do. •	My Garden of Flowers eases the emotional distress and the fear surrounding neonatal intensive care. •	Full of practical advice, information on common problems of babies in the NICU, charts, checklists, and coping tips, it’s a priceless resource to help parents care for their precious bundles while in the NICU and when they’ve come home. MANJEET KAUR, M.D., was born in Delhi, India, and graduated from Maulana Azad Medical College, Delhi. She completed her residency in Pediatrics at Children’s Hospital of Eastern Ontario, Canada, and her fellowship in Neonatal Perinatal Medicine from the Medical College of Pennsylvania, Philadelphia, where she stayed on faculty as Assistant Professor of Pediatrics until 1984. Happenchance brought her to Lancaster, Pennslvania, where she founded the first Neonatal Intensive Care Unit of Lancaster County in 1984 and was appointed Director of the Division of Neonatology. Under Dr. Kaur’s leadership, the NICU expanded to a facility caring for over 350 babies per year. •	In 2016 she received the Henry Wentz award given for outstanding contribution to LGH Graduate medical education and the Lancaster community. •	In 2017, Penn Medicine Lancaster Foundation established the Dr. Manjeet Kaur NICU scholarship, to be awarded to a NICU nurse for educational progress.